Sunday, April 15th: The doctor said that we were saviors from heaven. This morning we were awakened, not by the man on duty, but by Jerries strafing and our ack-ack letting go at them. I wish they wouldn’t begin their warfare so early in the morning. It is so annoying! The 2nd Armored Division and our 119th Inf. Reg’t. has been pushed back on this side of the river. Major Young was in the office today. It has been a long time since we have seen him, as the 119th has been with the 2nd Armored since crossing the Rhine. He said that the 3rd Bn of the 119th really had it rough on the other side of the Elbe River. For example, out of one Company, there were only five men left! 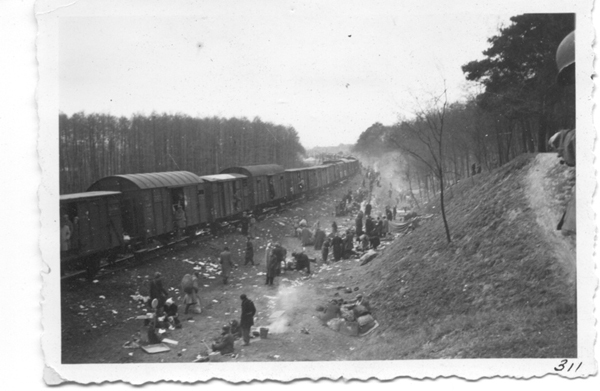 The town (Farsleben), that is located with the Extermination Train was evacuated of the German civilians and turned over to the members of the train. Capt. Fleming, of our 105th Engineers, found a warehouse filled with drugs, chocolate milk powder, baby food, bandages, and other medical equipment. Another warehouse was found. Major Huff went down to look into this one, and it contained about the same things. Trucks were sent to these warehouses, loaded and taken to the doctors in charge of these people. It was just like manna from heaven for them. Fifteen cases of Typhus had developed, and three other doctors were discovered among the group of prisoners- making a total number of five or six. Dr. S-, was put in charge, medically, by Col. Treherne. He was born in Poland, but a citizen of Chile. He received his degree in Poland (probably University of Warsaw). He studied in Paris, Berlin and Vienna. He specialized in Surgery, Obstetrics, Gynecology and Pediatrics. Col. Treherne said that he was a very smart man and very cultured. The doctor said that we were saviors from heaven.